In this week’s Week in Review: Twitter does autoplay, AOL does programmatic TV and Apple faces News backlash. For a weekly summary of industry news and other VAN interviews and videos, sign up to the weekly Video Round-Up. Twitter has announced an update that will introduce auto-playing video and animated GIFs to users’ timelines. The update will initially be on iOS and web and will mean all native videos, GIFs and Vines will automatically play with the sound muted by default, like on Facebook and Instagram. Advertisers will be able to buy TV space for their ads programmatically on AOL. The media owner has partnered with Australia media business Multi Channel Network (MCN) to form a programmatic private marketplace for television inventory. The media owner is also reported to be in talks with UK broadcasters. The terms and conditions for Apple’s News app have come under fire after it emerged that bloggers’ consent for the company to use their content was automatically assumed unless they explicitly opt out. The terms also include consent for Apple to place adverts next to their content without paying them and agreeing to cover Apple’s costs if legal issues arise from their content. In the same week, Apple announced it is looking for journalists, rather than analytics to curate the app. Ben Barokas, whose company AdMeld was purchased by Google in 2011, has unveiled Sourcepoint. The company allows publishers to ask their audience to support the content either through general advertising, interest-based advertising or subscription. YouTube Gaming, an app and dedicated website is designed to be a home for all Google’s gaming video both live-streamed and on demand. The platform will launch this summer starting in the US and UK. The platform also this week released support for watching 8K videos that reportedly crash users’ computers. UK industry web standards body JICWEBS has ramped up plans to target online ad fraud by unveiling a set of standardised guidelines for media buyers. The guidelines include questions marketers should ask publishers and third party inventory sources to to counter and reduce the risk of fraudulent activity. The Guardian US is to launch an innovation lab for developing new ways to generate news using upcoming mobile technologies. The project is being backed by a $2.6m grant from the Knight Foundation. AT&T Mobility faces a fine of $100 million, reports the New York Times, accused by the US Federal Communications Commission of misleading millions of wireless customers with unlimited data plans by slowing down their service without adequately informing them. Adblock Plus has announced its intentions to be adopted by SMEs and public organisations to help protect them from malware and ease up bandwidth. Mashable has released a new version of its Lift platform, which will allow brand advertisers to self-serve when purchasing Lift Units which appear on the Mashable news feed. Lift allows advertisers to share their social assets from a variety of platforms – Vines, Instagram, Twitter, YouTube, and others – on the site’s homepage. Google has begun testing a new system of ‘slow to load’ yellow warning signs for its Android mobile search results, alerting browsers to tardy content before they try to load. The Huffington Post UK has created a new audience group of media literate and positive minded readers who have a complex relationship with brands as part of wider efforts to offer deeper insights to advertisers. The publisher named the segment ‘Thrivers’ after research it conducted in partnership with YouGov revealed they were more susceptible to brands. 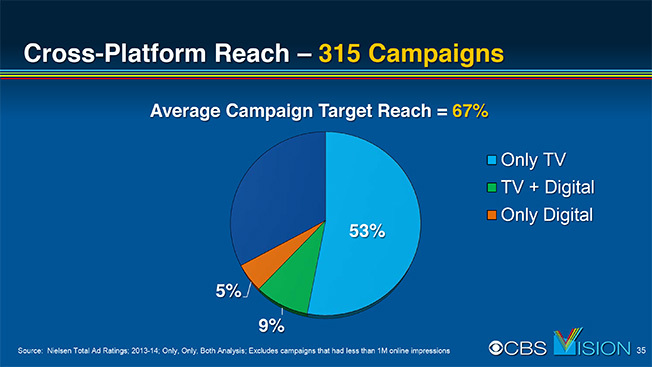 CBS joined in the fight for advertising dollars by presenting the findings of its study of cross-platform campaigns. According to the TV network, TV solidly beats digital in both spending and reach. Younger viewers are consuming less video on average each day compared to the rest of the UK but are more likely to spread their viewing over more platforms that also gives them more control, according to Thinkbox’s The ‘Truth about Youth’ report. Confidence In Online Ads Rises, Agencies Focus On Streaming Sites A survey of advertising agency executives from Strata suggests 44 percent of agencies in the second quarter say they are getting a ‘good value’ for recent online video ad purchases; up 43 percent from the previous quarter. A report released from the Reuters Institute for the Study of Journalism documents the rise of video and social media as a force in modern journalism. The report also suggests a surprisingly high percentage of consumers say they felt ‘disappointed or deceived’ by sites that produce sponsored content. However, BuzzFeed has indicated it gets better views and engagement on sponsored posts. IPTV ads have over a 90 percent completion rate according to the latest quarterly infographic by StickyADS.tv. The research also found that ads relating to hobbies such as video games had the highest completion rate. According to Digitalsmiths, Q1 2015 Video Trends Report, 81.6 per cent of respondents are interested in an à la carte pay-TV service where they can select, and pay for only the channels they want to watch. On average, respondents’ ideal á la carte package would consist of 17 channels and cost around $38 a month. Britons are falling behind their counterparts in the US when it comes to recognising the potential of social media, potentially harming the country’s position as a creative hub according to findings from education technology provider Scredible. Ad tech companies Virool and Rubicon Project are taking their mobile video advertising partnership into the programmatic arena. Virool’s InLine video promos, which automatically play between paragraphs of copy as readers scroll through articles, can now be purchased via Rubicon’s real-time bidding platform. Chinese web giant Alibaba has announced it plans to launch its own video streaming service called Tmall Box Office, or TBO. The Huffington Post quoted experts who thought the move could be a “substantial hurdle” for Netflix as it develops its own international strategy. Ooyala has integrated its video and ad tech platforms. A new plugin includes anti-ad blocking technology, sequencing for storytelling, audience targeting for ad personalisation and rich customisation capabilities. smartclip has launched an addressable TV platform, which enables advertisers and agencies to buy and distribute real-time linear TV advertising. Samba TV has completed its acquisition of Warsaw-based startup Filmaster, placing Samba TV in the European Market. Vimeo has teamed up with Samsung to produce an original short film series, ‘Connected’, whilst maintaining its ad-free status. AppNexus is to purchase Brazil-based RealMedia Latin America (RMLA) for an undisclosed fee in a bid to further its share of the regional market, which is forecast to undergo triple-digit growth in the coming years. A PWC report has called on the Australian media and entertainment industry to innovate and ‘have a go’, with the headwinds facing traditional media players set to continue through to 2019, according to a PwC report. Global OTT TV and video revenues will reach $51.1 billion (€45.5bn) in 2020; a massive increase from the $26 billion expected in 2015 according to the Global OTT TV & Video Forecasts report from Digital TV Research. According to research by IHS Technology, pay-TV subscribers grew by over 1 million in the past year. However, in the case of Sky, this growth in subscribers came from NOW TV sign ups. Ted Baker has opened its first ‘virtual’ store amid wider experiments with digital technology in a new concept store in London’s Shoreditch. Now TV is set to launch a Sky Sports Month pass which will enable consumers to access to Sky’s exclusive sport offering without being roped into long-term contracts. StickyADS.tv has promoted Greg Carroll to UK Country Manager. Carroll first joined in 2014 as Head of Publisher Development UK. Viewbix has appointed Rob Tariche to lead Eastern Sales in the US. Tariche previously worked at Adgent Digital (AdTouch). Google’s ad documents how a Kansas gym has helped a transgender man acquire the body he always wanted.